The Columbia River Guppie is a versatile and hard-working multi-tool, designed for portability. 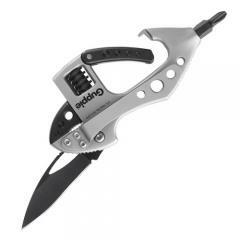 Its carabiner makes it easy to carry on a belt, D-ring or strap and doubles as a bottle opener. One end of the tool features an adjustable wrench that can open up to half an inch to perform a wide variety of jobs. The same end also includes a two-inch folding plain edge blade for cutting tasks. At the other end is a hex driver that can be used with any of the four included bits, two flat and two Phillips. The removable bit carrier attaches to the tool using a pair of magnets and features a built-in LED flashlight.